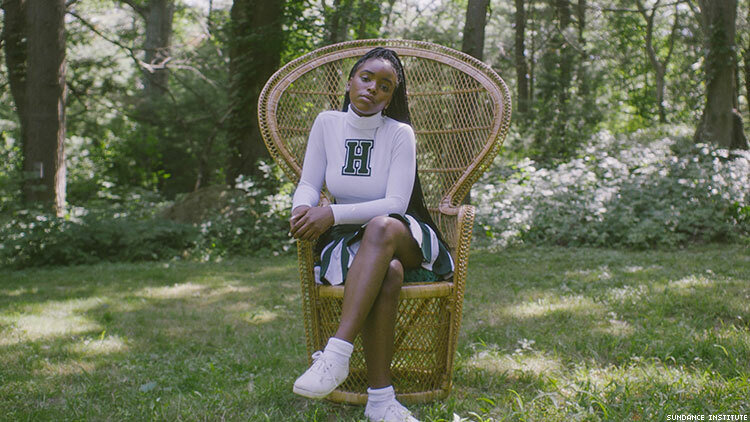 Film critic Joi Childs says the Sundance film ‘Selah and The Spades’ takes teen angst to another level. Speaking to Paloma (Celeste O’Connor) as she takes photos of the cheer squad, Selah (Lovie Simone) goes into the hardships of being on the cusp of adulthood: “They always try to break you down when you’re 17.” This quote from director Tayarisha Poe’s feature debut Selah and The Spades, which premiered at Sundance, perfectly captures the internal struggles Selah battles throughout the 96-minute film. Taking teen angst to another level, the film is dark and mature, showing the underground politics (and pecking order) of a prep school. Haldwell Prep School’s student body is run by 5 factions: The Prefects, The Sea, The Skins, The Bobbies, and The Spades. The Spades is the most powerful faction due to their access and distribution of pills and alcohol, making Selah Summers and her second in command Maxxie (Jharrel Jerome) heads of the class. We begin during Selah’s senior year, where between her mother pressuring her college decision, a mole in her faction, and training her successor Paloma, she is gradually losing her carefully-built control. Selah and The Spades shines brightest with the introduction of fresh talent leading the storytelling. Lovie Simone as Selah brings a level of intensity and ruthlessness to the role that’s captivating. She truly embodies “Queen Bee” in her mannerisms and there’s a level of haughtiness in the way she speaks to her classmates. To counter Lovie, Celeste O’Connor as Paloma, the “Queen Bee-in-Training”, works as a complement to Selah. Their chemistry is instant and it toggles between romantic, competitive, and admiring — which makes for engaging scenes between the two. The film gives an insider look into the teenage politics of this fictional school. The factions have secret meetings off school grounds, a la “Knights of The Round Table.” There are written rules and voting methods amongst the groups to keep order — there was even a written treaty after an incident sophomore year. The Spades in particular have a system to keep their drug operation running smoothly. They have an official ledger that keeps track of all their drug orders and leverage the pre-teen prep school attendees as drug runners. The operations are tight, with the faculty not suspecting how deep this goes. With this view we get of the factions, we also see how far they will go to keep their operations tight. The Spades are known to rough up customers who are late on payments and aren’t afraid to get their hands dirty. In one scene, for example, Selah encourages Paloma to beat up the mole they found. Paloma is clearly conflicted but goes along with it, walking away from situation with bloody knuckles and a shaken demeanor. Selah catches up to her and is not fazed by her reaction, even going to lightly joke about how badly Paloma’s knuckles look. Selah’s unflappable performance highlights that at its core, this film is a tale of how far someone will go to keep control. With senior year being her last hurrah, Selah is struggling to train Paloma as the next leader of The Spades while solidifying her impact after she leaves the school. Eventually, her thirst for power outweighs everything else and she drugs Paloma to “keep her humble.” This exposes Selah’s vulnerabilities and her acknowledgement that her reign has to come to an end. Calling back to Heathers and Cruel Intentions, Poe’s debut film doesn’t shy away from how cutthroat teenagers can be. Selah and The Spades centers on a teen scrambling to keep any semblance of power and by any means necessary. In that desperation comes betrayal, violence and mistrust — and it’s a joy to watch.